FRIDAY was a triumph for the men and women of BPS Recovery after partner Max Prentice’s Ticket of Leave (TOL) trounced the competition at the annual Chartered Accountants Regatta on Sydney Harbour. With son Matt at the helm, Prentice scooped the Division A teams event, winning the coveted Liquidators Cup in the process. 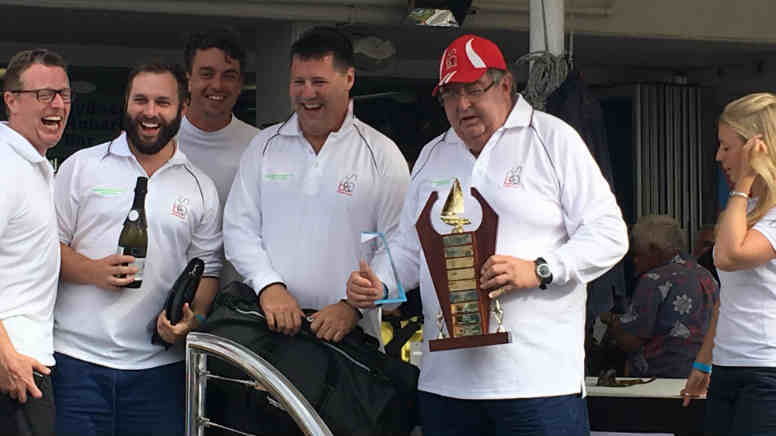 Fellow BPS team skipper Rob Pizzie took second aboard Tonic to entrench the glory among the red and white caps, who continued their dominance back at the Cruising Yacht Club of Australia by securing tables closest to the free paella. Once the results were announced the only complaints came from Prentice’s knees as he made multiple trips to the podium to accept trophies, to take possession of Musto-sponsored prizes and to pose for pictures. BPS co-founders Dave Sampson and Mitchell Ball – aboard Tonic and Next respectively – were also in the thick of the celebrations, as were staffers Daniel Frisken and Alan Ma. Amid the general bonhomie O’Brien Palmer’s Bryan Collis did recount a tale of relative woe, describing how he had been forced into a false start by over-enthusiastic “punters” who crowded one end of the line. The melee over by the start boat however left Ticket of Leave and Steve Proud’s Swish to approach the line by the pin unimpeded. With speed and sea room to spare both seized the initiative and never relinquished it. Other accounting notables taking part included Psalt Group chief Arthur Psaltis aboard Into the Mystic, Trumans boss Richard Cox aboard Marguerite, RSM’s Richard Stone on Akela and PwC’s Rebecca Cohen, who skippered Breakthrough. Apart from the piratical prices charged by the CYCA bar and attempts by staff to prevent the winner’s champagne being consumed on site, the only post-race gripes came from a participant lamenting the absence of many of accounting’s larger luminaries from the Westpac-sponsored event. He said outfits like Korda Mentha, PPB, Ferrier Hodgson, McGrathNicol,Deloitte and EY have faded from the fleet over the last five years and of the bigger accounting firms, Grant Thornton and PwC are the only regulars. Be the first to comment on "BPS sinks rivals at Chartered Accountants regatta"